Oleanders (Nerium oleander) are large, mounded shrubs with beautiful blossoms. 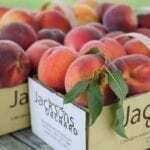 They are easy care plants in warmer climates, both heat and drought tolerant. However, oleanders can be severely damaged or even killed by winter cold. Even winter hardy oleander bushes can die if the temperatures drop precipitously. You can forestall damage to your plants if you learn how to overwinter an oleander. Read on for tips on oleander winter care. Oleanders are big shrubs. Most grow to 12 feet tall and 12 feet wide, and some shoot up to over 20 feet. But this doesn’t mean that they can survive cold winters without help. Winterizing oleander plants is possible, wherever you live. 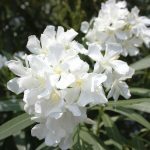 Oleanders are hardy in U.S. Department of Agriculture plant hardiness zones 9 through 10. This means that they can withstand the cold winter weather in those zones. Some winter hardy oleander bushes, like the cultivar ‘Calypso,’ can thrive in USDA zone 8. However, in zone 8, care of oleanders in winter is more difficult. You’ll have to take extra steps to help your shrub survive. Oleander winter care in zone 8 begins in fall. When you start winterizing oleander plants in this zone, you need to cut back the shrub in autumn by half. Do this while the temperature is not yet too cold. Then layer on some 4 inches of organic mulch over the root area of the plants and cover the remaining foliage with a sheet when the temperatures dip below zero. Watering once a week in winter helps keep the plant from freezing. If you live in even colder zones, winterizing oleander plants means bringing them inside in the coldest months. Start by cutting the bush back severely, by some two-thirds, before cold weather arrives. Then dig carefully around the roots of the shrub. When you can free the roots, pot them up in a container with good soil and drainage. Move the pot into a sheltered area that still gets sun, like a garage with a window or porch. Give the same treatment to plants already growing in pots.